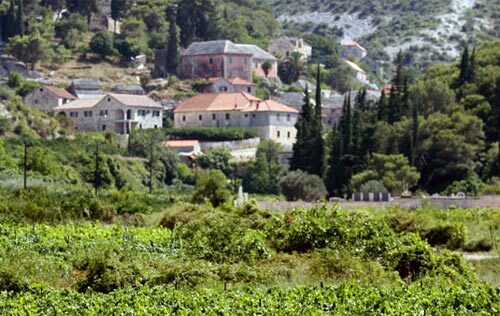 Tavern Crkveno is located in Dol, which is one of the loveliest villages on the whole island of Brač. It is a bit remote, feeling nearly dropped in to a small valley in the interior of the island which is the progenitor of its name, ‘dol’ meaning ‘valley’ in Croatian. While a decent-sized placed 60 years ago, it’s just 1/8th the size it used to be with just 112 residents. The winemaker of Tavern Crkveno is Frane Matulić who had a long history of working for the Badel 1862 corporation in Zagreb, who are a wine and spirits conglomerate in Croatia. He returned back to his home village to make wine and he’s been doing it for the last 11 years all-the-while slowly accumulating the many pieces of equipment needed to produce wine on a large scale. He makes a Plavac Mali in both standard and barrique versions, a Pošip, and then two Stolno level wines: Viver (a red) and Vipera (a white). His Plavac Mali is quite good, but still a bit irregular as he experiments with different times in the barrique. Overall, it has a nice, meaty body with an earthy nose. There are some moist blackberries as a smaller aroma to the nose as well. The finish comes out buttery and round. Overall, it’s a good wine for everyday drinking that even in its current incarnation is sure not to disappoint. Frane emphasized to us that future vintages are going to be even tastier and deeper now that he’s managed to wrangle his new barrique in to line which have been a varying mix of new and old and from different makers as he built up the winery.